I wrote this after coming back from Masai Mara last year and thought of posting it today because a lot of our participants accompanying me to Mara this year wanted to know about the equipment preparation to be done for the much awaited tour! 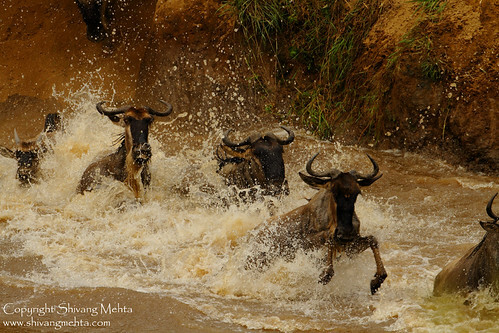 Photography in Masai Mara was a subject of my research as soon as I firmed up my plan to lead a group of photographers for the Migration Uncut camp in Aug 2011 along with my dear friend Aditya Dicky Singh from Bagh Safari. Aditya had been constantly giving me his briefs on photography in Mara from his 2010 visit and in December 2010 I started seeing the works of a lot of photographers who have covered Mara and specially the Great Migration in the past. Some of the internet articles were quite informative but what really helped were the photo stories as it was great to see the frames, compositions and perspectives taken by photographers from across the globe. After all this research, I landed in Nairobi with 2 Canon 7Ds and a Canon 50D along with my Canon 500mm f4, a Canon 70-200mm f2.8 and my 10-20mm wide (these were the broad level basic equipments I carried). I was actually in two minds whether to carry the 24-70mm f2.8 rather than the wide for the ultra wide habitat perspectives but preferred the 10-20mm fir I thought it would be useful for landscapes and I would use the 70-200 for the habitat shots. 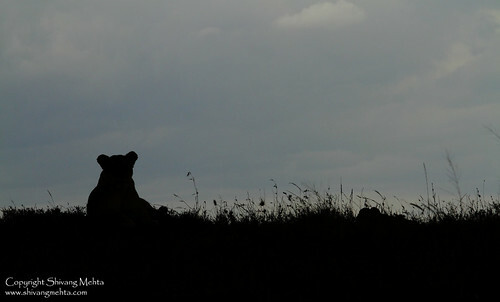 I learnt my first lesson on photography in Mara within a few hours of my entry in Masai Mara. My first safari started a bit late and as I took a short round under fading light conditions, I was shooting at an ISO below 1000 (around 500 to 640 to be precise). 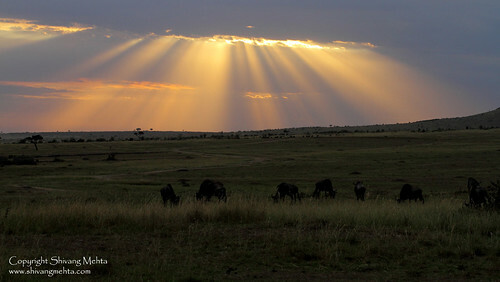 Though the sun was touching the horizon, the Mara terrain is never short of light. The savannah is open landscape and light falls directly on the subject unlike forests of India where the light is diffused because of the thick vegetation. My second lesson was within the first 2.5 hours as in this short span I had already exhausted my 8GB card which I thought will last because I was going for a short round. 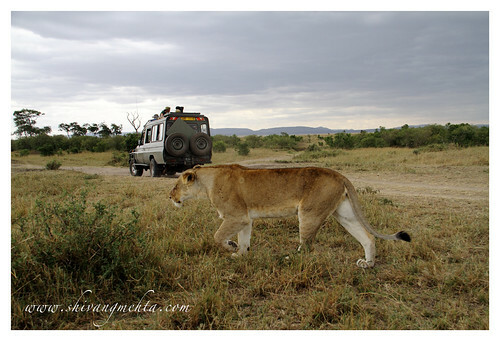 It will be wrong to say that you can’t afford to be trigger happy in Mara. You can’t avoid it! For there is just too much of action around you and you just can’t resist the photo opportunities. Especially in the months of Aug and Sep, if you are staying at the right location (which enables you to be in the heart of the action areas) the action eats away all the tucked up memory! The main culprit is migration photography. 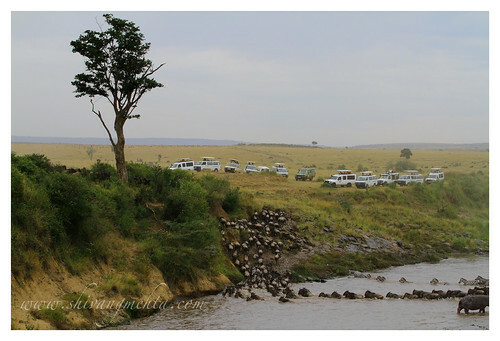 A big river crossing comprising anything between 5000-10000 wildebeests has the potential of consuming 8GB of memory in 10-15 minutes. Using 4GB cards in Mara is not a good idea for you lose crucial moments while changing of cards. Safer bets would be high speed 8, 16 or 32 GB. Crossings are tricky to shoot for the action is fast and you don’t get time to review your photos. But the flip side is that if you quickly glance through your shots to check if the exposure, focus and frame is right you can get back to work since the herds give you opportunities to shoot again. Typically you may mess up the first crossing you witness because if you witnessing the phenomenon for the first time in your life the excitement of coming face to face with the one of the biggest wildlife spectacles on the planet overpowers your photography and you end up with screwed up pictures. 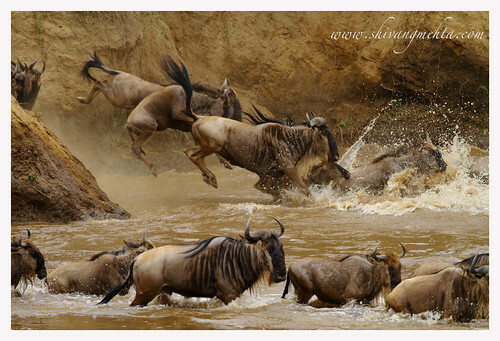 Yet again, if you are staying at the right location in Mara, there are high chances that you will witness more and more crossings and with each crossing you gradually realize the dos and don’ts as far as crossing photography is concerned. It was after 3 hours that I pulled out my second body with the 500mm to shoot a lion pride that because that was the first subject at a distance. Mara is probably the best place in the world to create stunning habitat perspectives. The accessible terrain increases the proximity to your subjects including big cats thus opening doors of experimentation and innovation. Having spent a week under such shooting conditions I realized that 60-65% of my wildlife shots were taken using a 70-200mm f2.8 lens. I used my long lenses at times to create tight compositions and for taking those tight river crossing shots but the variable zoom was the pet lens for me. I used it to high effect while shooting critical action sequences like lion hunting as well. In our group of 12 Nature Wanderers participants, we have as many as five 100-400mm users and I am very happy with the quality of images that all our participants have produced. Essentially Mara as a location has the potential of giving great image to photographers using all sorts and all strata of equipments. So just carry enough batteries and cards so that you don’t run out of ammunition. 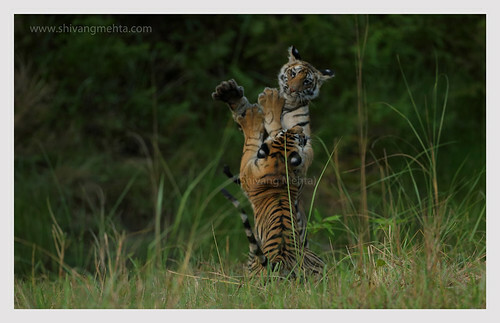 Vijaya’s young battalion of 3 cubs were very quite for the past few days. They were giving brief appearances in the Sidhbaba grassland and in the presence of Mom and Dad (Sashi) loitering around in the Jumuniah area the cubs were lethargic and did not indulge in any major play as the sun went down. However yesterday the scenario was different. Dad headed of to the badi gufa and Mom was out on a hunt. 5pm in the evening, the cubs made an appearance from the cool swamps under the jamun trees in front of Sidhbaba and for the next 45 minutes they displayed some extraordinary play which have not been witnessed in Bandhavgarh for ages. 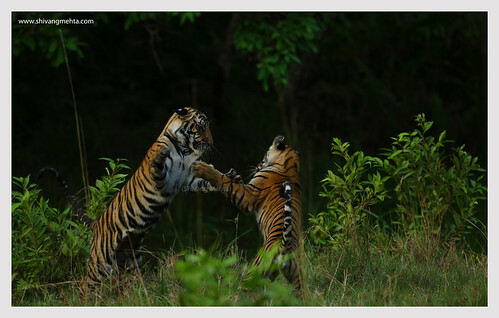 Punches, chases, arial fights, bonding, love – it was a mix of emotions and the spectators were spell bound seeing the energy level of these cubs. The grassland had become a boxing ring for these young guns as they played merrily for the whole evening and continued to enjoy the session event after the tourist vehicles called it a day.